Crates - LIVING AND CO.
HKliving metal storage boxes. The HK-Living vintage storage boxes look perfect in the living room for storage, but are also very handy in use and fun to combine with the latest HKliving collection! Set of 3 pieces. HKliving hand woven baskets made of Milulu grass. The HK-Living terracotta baskets can be used as a basket but also very beautiful to use as plantholder. The baskets come in a set of 3 pieces. 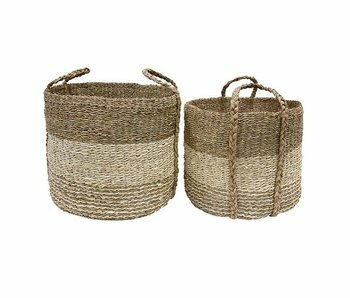 HKliving braided baskets set made of sea grass. The HK-Living seagrass baskets can be used as a basket but also very nice to use as plantholder. Perfect combined with the new HKliving collection. HKliving rattan basket set. The brown HK-Living rattan baskets can be used as a basket, turned around they can be used as a table. This comes in a set of two baskets. Nice wooden casket from Dutch brand HK Living. Made from mango wood and perfect to store belongings like blankets residential, lifestyle magazines etc. The boxes can differ from one another because they are painted by hand.